Heat olive oil in a medium skillet over medium heat. Add zucchini and corn and season generously with Kosher salt. Cook, stirring occasionally, until vegetables are softened and cooked through. Remove from heat and set aside. Top four tortillas with Daiya Pepperjack Style Shreds. Add a spoonful and evenly spread the zucchini-corn mixture to each, and then top with remaining tortillas. Heat a medium nonstick skillet over medium heat. Spray with non-stick cooking spray, then cook quesadilla until cheese slightly melted and tortilla is golden brown and crisp. Carefully flip tortilla and cook until tortilla golden brown and cheese is fully melted. Repeat with remaining quesadillas. 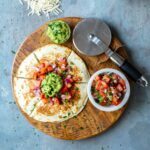 Slice quesadilla into 6 wedges and top with pico de gallo and guacamole. Devour!